An Audi e-tron prototype at the Geneva auto show in March. The production version goes on sale in August. BERLIN -- Audi said it plans to sell about 800,000 battery-electric and hybrid powered cars in 2025, when it also expects to generate operating profit of 1 billion euros ($1.2 billion). Audi will launch more than 20 electrified vehicles by 2025 thanks to an ability for using parent Volkswagen Group's new MEB modular platform and vehicle underpinnings jointly developed with premium sibling Porsche, it said in a statement. That's slightly more ambitious than the 20 electrified vehicles Audi had previously guided for. Audi's 800,000 goal would be about one-third of projected deliveries in 2025, exceeding the target range of 15 percent to 25 percent of competitors BMW and Mercedes-Benz. Audi declined to provide details about how many full-electric, and how many hybrid cars it will sell by 2025. Last year, it sold about 16,000 semi-electric vehicles and it still lacks a full-electric model in its lineup. The automaker, which delivered 1.88 million cars globally last year, currently offers three plug-in hybrid vehicles. 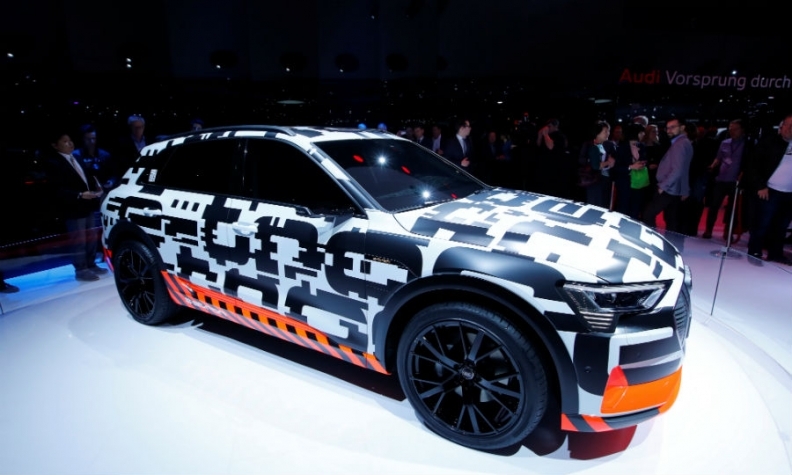 In August, Audi will launch the e-tron SUV, its first serial all-electric model. Demand for large SUVs has helped to make Audi VW Group's main profit driver. Audi said it would launch the cars without undermining its 8 percent to 10 percent operating margin target. The automaker is gearing up to boost profit outside its traditional business of producing and selling upscale cars in a push against Silicon Valley's software giants that are keen to mine potentially lucrative vehicle data. The strategy involves tapping into the time people spend in their vehicles and the data that generates to offer services such as automated parking and in-car shopping. That would amount to nearly a fifth of last year's profit. "We are accelerating the global rollout of new, profitable business models in those areas we believe will be material to our industry in future," Audi Chief Financial Officer Alexander Seitz said. "This will allow Audi to protect its high margins despite significant investments." Audi said it is installing a central product management unit reporting directly to the CEO to steer the planning, implementation and operation of digital products. To fund its electric-vehicle offensive through to the middle of the next decade, Audi has extended by three years until 2025, an investment program worth about 40 billion euros ($47.42 billion). To maintain profits and free up funds for battery-powered vehicles, Audi is looking to step up cost savings beyond a goal of 10 billion euros announced last year, CEO Rupert Stadler told reporters on a conference call. "We want a tad more," Stadler said, referring to the efficiency target. "In electric mobility, we want to become the number one among the premium manufacturers." To reduce costs Audi is ceasing production of some models, including three-door versions of its A1 and A3 vehicle lines, as well as cutting component and administration costs. Audi's image has been tarnished by regulatory probes investigating what role its engineers may have played in designing engine management software to cheat modern emissions tests. On Tuesday Germany's Transport Ministry said the KBA vehicle authority was investigating a further 60,000 diesel-engined Audi cars for suspected illegal manipulation software which may have helped the automaker cheat emissions tests.